MOSCOW, June 25. /TASS/. 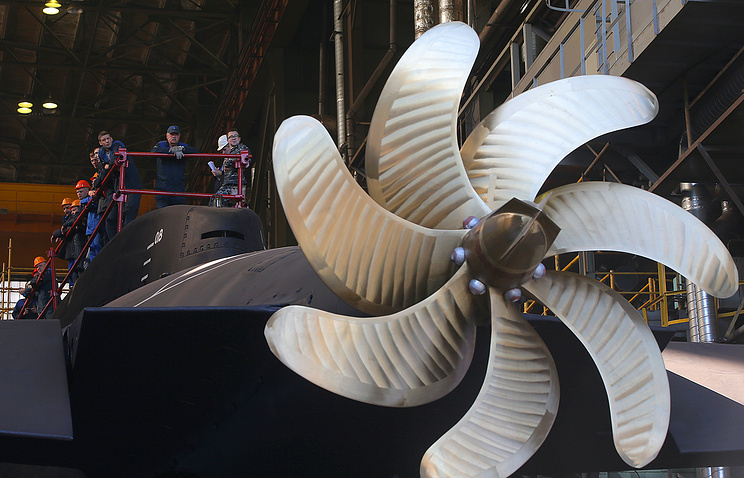 Two Project 636.3 Varshavyanka-class diesel-electric submarines will be handed over to Russia’s Pacific Fleet in November 2020, according to an annual report of the Admiralty Shipyard released on Monday. "The Project 636.3 diesel-electric submarine designed by the Rubin Central Design Bureau (two subs) - November 2020," says the list of projects the Admiralty Shipyard is implementing in 2018 and next year. The first two out of six Varshavyanka-class diesel-electric submarines intended for the Pacific Fleet were laid out in July 2017. They were called the Petropavlovsk-Kamchatsky and the Volkhov. As was reported earlier, the first of the submarines was expected to be delivered to the fleet in November 2019. Six such conventional submarines are planned to be built for Russia’s Pacific Fleet until 2022. The first series of six submarines was built for the Russian Black Sea Fleet in 2010-2016. They are capable of developing a surface speed of up to 20 knots and dive to a depth of 300 meters. They have a sea endurance of 45 days and a crew of 52. The Project 636.3 submarine displaces about 4,000 tonnes in its underwater position.